In late May of 1984, a night-mist rolled inland to Somerset, leaving in its wake a horror. Few noticed immediately. Those who did, though, acted swiftly. Within hours, a small boat troop of SAS agents performed an insertion mission to Somerset, but only two returned. They were unable to make a final report, and could only rave about some sort of cannibal bloodlust. Aerial surveillance of Somerset revealed innumerable motionless bodies lying all about the city of Bath and surrounding landscape, many of which had been stripped of flesh. Field research revealed that a blood-borne “entity” was to blame. Those “infected” became ravening monsters, losing all sense of self and self-preservation and seeking only to kill and feed on… human flesh. The Prime Minister passed the Special Citizens’ Act in an emergency session of Parliament. This measure gave Special Branch the authority to detain — or liquidate — any citizens suspected of having a connection to the disaster. Paranoia spread as quickly as the tragedy, and hastily built detainment facilities teemed with thousands of prisoners across the country. Special Branch arrested anyone and everyone, victims of the horror and suspected conspirators alike. It wasn’t enough. The horror spread too quickly. The detainment camps collapsed. Terrified people rioted, looted, and destroyed places suspected of being havens for the infected. The cities, towns, and countryside were a ruin. The World Health Organization and the United Nations quarantined the entirety of the United Kingdom. International forces established three camps, one in Liverpool, one at Aberdeen, and one in London, where they could evacuate those who proved to be untainted by theentity. A broadcast transmission implores survivors to seek the quarantine camps if they can make the trip. You are one of those survivors, still clinging to life two weeks after the disaster. You and a few other individuals have convened in the basement of a block of council homes in Birmingham. The closest camp is Liverpool, just under a hundred miles away to the northwest. It’s by far too dangerous a trip to make by oneself, especially since it’s unknown what obstacles lie between here and there, but with the safety of numbers, it just may be possible. Some posho’s flunky comes up to you and offers to strand you in a malarial jungle swamp, in which you must busk for enough money to outfit yourself for an expedition into a death-god’s lair and smash an artifact so the posho can have her hit points back. When you’re done, abase yourself before the merchant prince’s manor where she’s staying to let her know she’s good to go home. Okay, maybe that’s a bit of an unfair summary of the framing device used to kickoff Tomb of Annihilation — but it’s not too far off course. For the record, I really like a lot of what ToA has to offer in terms of gameplay, but some of its setting assumptions rub me the wrong way. I’m planning to run it, but not stock out-of-the-book. It’s no secret that I love exploration campaigns. When preparing a new campaign, perhaps the most important ingredient is the call to action. Your “elevator pitch” to the players should suggest to them exactly the sorts of adventures they’ll be having, and they’ll imagine characters they can project into that expectation of action. Everything in your preparations should point back to that question: How will the campaign use this detail? Luckily, I recently ran across this tweet, which prodded me in the right direction, I think, for a game more in keeping with my tastes, and also that empowers the players more than making them thralls to a fantasy one-percenter. For the next reboot that makes men angry I’d like to submit for your consideration Lupita Nyong’o as Indiana Jones. She steals artifacts from museums and returns them to their rightful cultures. Yes. Excellent. Flip the assumption. With that principle in mind, I bashed together the campaign notes below. So how, then, can I frame the events of Tomb of Annihilation so that they can be used in the context of a reverse-grave-robber premise? The PCs are members of a sociopolitical faction known as the Reclamationists. They can be native Chultans with an interest in protecting their own destiny, or they can come from abroad, acting against exploitative interests seeking colonial dominance of the jungle. The PCs are rebels, a resistance faction, heeding a moral mandate. Playable characters. Okay, maybe this is a still from Black Panther. You get the point. An ecological interrelationship exists between humans and nature, acknowledging the inherent connections between people and their surroundings. Economic value derived from land (including natural resources and natural opportunities) belongs equally to all members of society. Cultures and communities make sovereign decisions for themselves, and outside influence intrudes upon that sovereignty. The most commonly accepted origin of the Reclamationists is the unification of a druidic circle and a locality of tenant farmers. With the spiritual guidance of the druids, the land-workers rallied to a common cause, giving rise to the faction’s motto, “All who believe are together and have all things in common.” Reclamationism spread among numerous land-working classes, and various offshoots of it exist, from deity-aligned dominionists to secular humanists and everything in between. It is a form of agrarian populism and often finds antagonism from traditional feudalists, across numerous nations. Occupy! Reclaim public lands that have been privatized. Dig them over, pull down hedges, fill in ditches, etc. to plant crops. Ex. : The Order of the Gauntlet may have some admirable aims in opposing the undead, but it may have more imperialistic aims, and cannot be completely trusted until any other objectives have been discerned. Expect a great many undead foes. Undead are an inarguable call to action. In my day job working on computer games, I’ve been looking into a number of games that have procedurally generated features. From algorithmically built worlds to randomized characters, the computer creates various components and turns the manipulation of them over to the players. The result is an emergent narrative of the players’ story. Consider this in contrast to a more heavily scripted game structure in which the narrative beats are specifically planned. In games with key procedurally generated components, the heaviest decision making and the consequences imposed on the world are driven by the players’ choice, as opposed to the narrative designer’s (or in this case, the GM’s). While the GM always arbitrates the rules, some amount of outcome is always dictated as a result of player choice — because interaction is what distinguishes a game from more traditionally consumed media. Heat Signature features procedurally generated characters and game spaces, and this critical video posits that three questions form the basis of the player’s interactions with and investment in the game. A simple expression of these three questions translates into the medium of tabletop RPGs, as well (and isn’t contingent on procedural generation). Example procedurally generated 3D geometrical prints. What do the players have? In this case, “have” is a broad understanding of the characters’ capabilities. This can include everything from their equipment to their skills to unique powers or functions. D&D’s class features, Vampire’s Disciplines, Mutants & Masterminds’ Advantages: These are all under the umbrella of what the players have, and they go a long way toward satisfying the essential experience of the game. The players can have much or they can have very little — the story of the game is about using what they have to effect change. At its simplest, what the players want is their immediate objective. Save the princess. Slay the dragon. Intercept the shipment. Beyond that, the game grows in complexity and the story grows in meaning as the players layer their characters’ personal desires with the shared narrative goal. The archetypal adventuring party is the most common example of this, and Vampire made much of subverting common goals and interleaving them with conflicting personal goals. Most games build upon the relatedness of goals by constructing the players’ various aims that can be represented as Venn diagrams, and groups that have good dynamics often see player characters assisting each other in achieving their personal objectives. An example of where a party’s interests and goals may overlap. Note that Limahl later went on to a musical career with Kajagoogoo. This is up to you. This is the intersection of what the players have, what they want, and how the game systems model their attempts to achieve their goals with the tools at hand. This is where the verbs happen, this is where the static scene becomes a dynamic story. This is why everyone gathers around the tabletop. When you’re running* a game, avoid making a player lose a turn. Game design doesn’t have many universal truisms, but this is one. Players play games to fulfill needs. And when you prevent a player from taking an action, you’re literally preventing that player from having any ability to satisfy those needs. Paralysis, fear effects, stunning, etc. are all conditions that sound cool or thematic, but actually undermine the reason people play games to begin with: to see the outcomes of their actions, to improve at the actions in play, to relate to one another, and to exercise choice. If you’re not letting a player play, why are they at the table? Note that, in most cases, it’s perfectly acceptable for a player to deprive a GM character of an action. The GM is often in the position of taking actions for multiple entities, and the nature of the GM’s participation is different from the way the player interacts with the game. Indeed, games that rely on creating strong tactical advantage (D&D 4e, Pathfinder, etc.) can actually benefit from depriving GM entities of their actions, as it streamlines play and hastens decision-making back into the players’ hands. “Getting into the dungeon” is usually a straightforward affair, and one without a huge amount of significance. It’s often glossed over; on occasion it’s used as a change to spring a tone-setting trap on unwary players or to deliver an ominous expositional portent. Moving through a dungeon is often similarly linear, offering a few more choices, but modern design by and large drives players through a series of escalating challenges to an ultimate “boss fight” or consummating set-piece conflict. Constructing location-based adventures with multiple choices and multiple points of ingress offers a host of satisfying decisions to players, and are equally as fulfilling to GM while watching the deliberations ensue. As you can see this provides a wealth of significant decisions for the players to make during gameplay, and it provides them numerous opportunities for action. Stuff like this is why people play games to begin with as opposed to consuming more sttaic media: to see the outcomes of what they do. Dungeons in fantasy games are the most immediately obvious example. The original Succubus Club for Vampire was set up with an “open floor plan” that allowed players to move through it and claim micro-territory in this most prestigious of Kindred hangouts, and even included a basement “labyrinth” for clubgoers who deliberately wanted to lose themselves in its environs. Bars, dance floors, VIP booths, cocktail tables, the DJ booth, the coatroom, etc. can all be locations in a modern “dungeon,” with numerous ways to approach them. Multiple choices can also capitalize on the themes of fear present in horror games, whether being lost in the caverns where a cult of Deep Ones worships in Call of Cthulhu or searching for your beloved in the mall’s service tunnels and boiler rooms in Monsterhearts. Games like Spycraft, Night’s Black Agents, and Leverage can have “dungeon crawls” through environments like corporate skyscrapers, fallout shelters, derelict churches, apartment high-rises, and warehouse complexes. Mazy spacecraft, military outposts, and planetary strongholds can translate the experience into games like Star Wars, Stars Without Number, and Starfinder. And of course, post-holocaust games can adapt any of these locations and more, whether as leftovers from collapsed civilizations to new constructions erected by dangerous mutants or reavers. The following techniques can help you design game spaces that offer a great deal of autonomy. Favor authenticity over realism: You can enter and exit the monster’s pit by being dropped through the trap door in the throne room floor… but also through the tight, twisty tunnels the vermin in the kitchen have burrowed. Who cares if the vermin don’t actually burrow and that it doesn’t make sense that the kitchen is next to the monster pit? What’s important are the choices and the thematic consistency, and to suggest that someone else down there has an interest in smuggling food to the pit monster…. Staged complexity: Not everything has to be available to the players immediately. Oftentimes, players will enjoy a chance to revisit a known, “mastered” portion of the location that poses new challenges. Over the course of the players’ exploration of the site, open additional options to them. Pulling a lever on level three opens an additional entrance to an unexplored section of level one. A room on the surface that’s initially inaccessible can be unlocked with the password offered by an NPC encountered in a lower level. An entire floor can rotate, changing the layout of a “known” location and granting access to previously unknown areas. With weird magic or superscience, entire portions may even vanish or be revealed “when the stars are right” or other criteria are satisfied. Thus the additional options open to players once they’ve already been introduced to the location, so they’re not overwhelmed by it. Blog necromancy! This entry is a few years old (cross-posted here from an older blog), but remains valid in terms of design philosophy. In game design, “too powerful” is a misleading phrase. The actual design should reflect “It needs to cost more.” A power or effect should remain pretty true to its original design. Mind control needs to feel like mind control — you can’t take a little bit away from it and hope to elicit the same in-game effect or the same player enthusiasm. A lightning blast needs to be a levinbolt that electrocutes its target, not a wee spark that sizzles foes for a li’l bit of damage. Hyper-speed needs to be fast… no, faster than that. 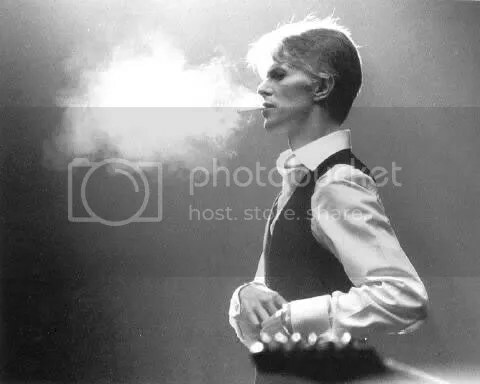 David Bowie’s cone of frost breath weapon needs to crystallize targets caught in the blast radius. This isn’t to say that there’s no place for low-powered effects. Those certainly have their place, particularly in level-based systems* that gradually step up the potency of what players can do. In these cases, the price is still important, and they still need to be relative to the effect, so it stands to reason that the costs should be commensurately lower. One of the design philosophies that resonates with me is that all special effects should feel overpowered. As the player, I’m the coolest thing in the game, so everything taking place in the game should reward me for being there. When I do something — particularly something that my character has as an edge, such as a superpower, special skill, or supernatural ability — I should say “WOW!” when I use it. This engages me and empowers me. This is one of my rewards for spending time with the game. This can be a visual effect in a video game, a chance to spend a unique resource in a board game, an effect only my character type can create in a tabletop RPG, or the ability to use a special type of card in a card game. My choice in choosing a play style contributes a lot to this. If I’m a psychic spy, my WOW! moment might be using my psychic powers to command or confuse my enemies. If I’m a wizard, it could be an icy blast that freezes my enemies, causing them damage and immobilizing them. A fighter type can stun an opponent with a rabbit punch or disembowel him with a dagger. The fact that it feels overpowered doesn’t mean it should be overpowered, though, and that’s where the cost to create effects comes in. A particle effect and some audio feedback in a video game can provide that overpowered-feeling WOW! for even an average effect. Rockets and missiles in EVE, for example, land with a resounding explosion that feels very satisfying. They don’t do inordinate amounts of damage, but they feel exciting when they hit. Every character class in D&D 4e has nifty “at-will” powers that feel unique and exciting, even though they really amount to little more than a basic attack with a minor bell or whistle attached. The Disciplines in Vampire make the Kindred a cut above mortals, and since there are way more mortals in the world than there are vampires, Disciplines are both rare and empowering. The prices to invoke all of these effects, whether it’s ISK-per-missile, blood points, or frequency, keeps everyone important — players — on the same playing field. That’s the challenge — creating the feeling of awesome while still preserving the integrity of play through managing the cost of effects in resources. Class-based game systems are occasionally described as offering “niche protection” as part of their design. The cleric is a healer, and no one else heals as well as the cleric, for example. The rogue excels at dealing damage; the fighter withstands punishment like no other. The wizard controls the crowd and/ or damages wide areas. Each of these roles has a thing it does well, so the “niche protection” statement is true. But, in a larger design sense, what niche protection actually offers is an ecology of dependencies that build relatedness between players. A party of four fighters won’t fare as well as a more rounded party, because many of the things fighters depend on aren’t offered by other fighters. (Of course, some systems offer ways to vary the makeup of various classes, but these variants are rarely as potent in their variant role as the core class structured to meet the dependency.) The cleric’s job is to keep everyone standing, something that no other class does as well; the other players depend on the cleric for this, accordingly. The fighter’s job is to keep threats focused on him; the other classes depend on the fighter taking the most heat so they can perform their functions. The rogue is augmented by sneak attack damage, so she eliminates threats quickly, but she relies on the cleric to keep her standing and the fighter to keep enemy attention on him. Designing for these dependencies not only helps the player group maximize its effectiveness, but also helps strengthen the relationships between players. And since games are a social endeavor first and foremost, rewarding those relationships is ultimately a proven method of keeping the players engaged for the long term.